Play with Walnuts – Happy Pesach! So why is the night of Passover not like all other nights? Because on this night we question, we dip, we taste and we sing, we recline to eat, we serve special food, and more. Unlike a normal meal during the year in which we simply sit and eat, the Pesach meal is a collection of deviations from the norm, an evening filled with special activities which transform the entire meal into an experience engraved on the hearts of all who partake. The Passover Seder replicates, among other things, an aristocratic ancient Greek meal, in which the diners would eat from a reclining position. At the end of the meal, the Hellenists would eat desert (or “afikoman” in Greek), which included walnuts. However, following the Mishnaic tradition of not eating desert after the Pesach sacrifice, the Talmudic Sages (Tosefta Pesachim 10,8) ruled that after eating one could not serve desert, such as walnuts, dates, and roasted grain – for the obligation is to concentrate on the laws of Pesach all night…” In his commentary to the Tosefta, scholar Saul Leiberman explains that it once was the custom to treat desert as a type of public celebration, which would often involve going from house to house and increasing the celebration. As this took away from learning the story of Pesach, our Sages rejected the custom. The Mishna, Talmud and Tosefta all mention many of the various uses found in the walnut. The shells of walnuts and pomegranates are rich in pigments used in dyes and were therefore included in the list of fruit not to be sold commercially during the Sabbatical year. The ink derived from walnuts and pomegranates is also used for writing a get (Jewish divorce contract). As with all nuts, the seeds of the walnut are rich in oil, which had several uses, including lighting. “Rabbi Tarfon said that (Shabbat candles) can be lit only with olive oil. Rabbi Yochanan ben Nuri rose and said…what will people do in Madai (Persia – modern-day Iran) where all they have to use is walnut oil…?” (Tosefta Shabbat 2,3). Rabbi Tarfon, who lived in Lod (very near Neot Kedumim), had an abundance of olive oil at his disposal, so he allowed only that, the finest of oils to be used for Shabbat candles. Others of our Sages were aware of the needs of Jews of the diaspora, where olive oil was not as easily obtained as it was in Israel, so they allowed other oils, including walnut oil, to be used. The unique structure of the walnut, consisting of two parts connected to one another, has been used to symbolize fertility and to represent the relationship between a man and his wife. Because of this symbolism it was customary to throw walnuts at the bride and groom at weddings, a custom mentioned by the Talmudic Sages in Tractate Brachot 50b). While the inside of a walnut is very good to eat, in between the two edible halves is a bitter divider. This too correlates to a married couple, who have the ability to make their relationship either “sweet” or “bitter”. The common walnut (Juglans regia) is also known as the Persian walnut, California walnut and king’s walnut. It is a member part of the nut family, Jurylandaceae. The Latin family name Juglans is actually a combination of two words – Junca glans – which can mean either “covered acorn” or “acorn of the god Jupiter.” The species name, regia, is Latin for ‘king’ which is the origin of one of the modern names of the fruit, the king’s walnut. The walnut is monoecious (male reproductive organs are separate from the female ones existing on the same plant), with ‘feathered’ leaves that contain 5-9 large leaflets and a very distinctive smell. The walnut blossoms in the spring and ripens in the fall. During blossoming the male leaves hang downwards looking like earrings. The female plants are grouped together on the ends of the branches and are pollinated by the wind. 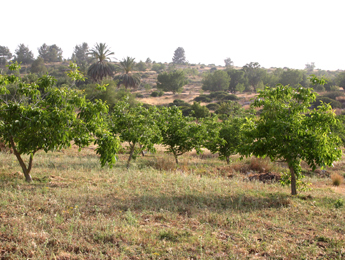 The large amount of water needed to grow walnuts, as well as its susceptibility to many sources of damage, such as the leopard moth that burrows into the tree trunk, make it no longer commercially viable in Israel(3). The walnuts at Neot Kedumim can be seen and even tasted in the “Valley of the Song of Songs” where you can also see several other plants mentioned in the biblical Song of Songs. (2) “The Fruits of Israel”, Assaf Gur, 1974.